This lovely Bat Mitzvah invitation on bright white card stock by Checkerboard features heart-shaped leaves in Bermuda-blue and Pewter-grey. This lovely Bat Mitzvah invitation on bright white card stock by Checkerboard features heart-shaped leaves in Bermuda-blue and Pewter-grey. On the front, your name prints at the bottom and a Bermuda-blue satin ribbon completes its appearance. The inside left has a sleeve in which your accessory cards may be inserted. Measures 7-3/4″W by 5-1/4″H when folded. Shown with Smoke ink and typestyles Futura Light and Futura Light LS (block text), Mr Blaketon (script text), and optional Sela (Hebrew text). This invitation ensemble comes with single Bermuda blue wallet flap envelopes. 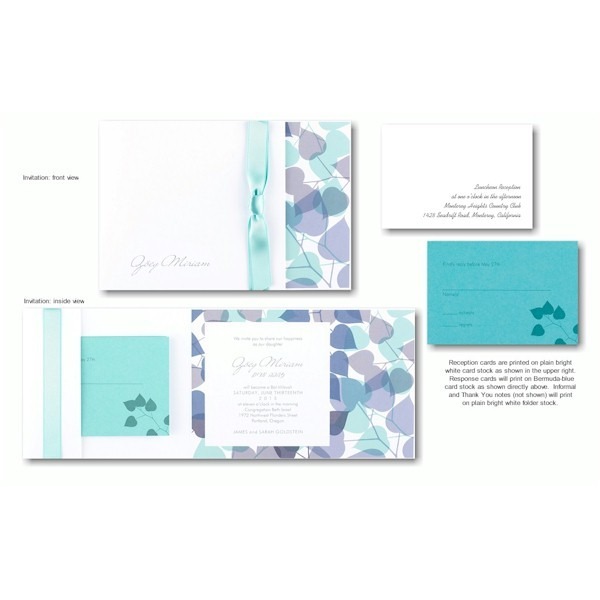 The Reception cards will print on plain bright white card stock; Response cards print on Bermuda-blue card stock with a floral motif in the lower right, and Informal and Thank You notes will print on bright white folder card stock. See large image for details.